Sometimes a compromised immune system is simply due to an unbalanced diet lacking in essential minerals and vitamins. 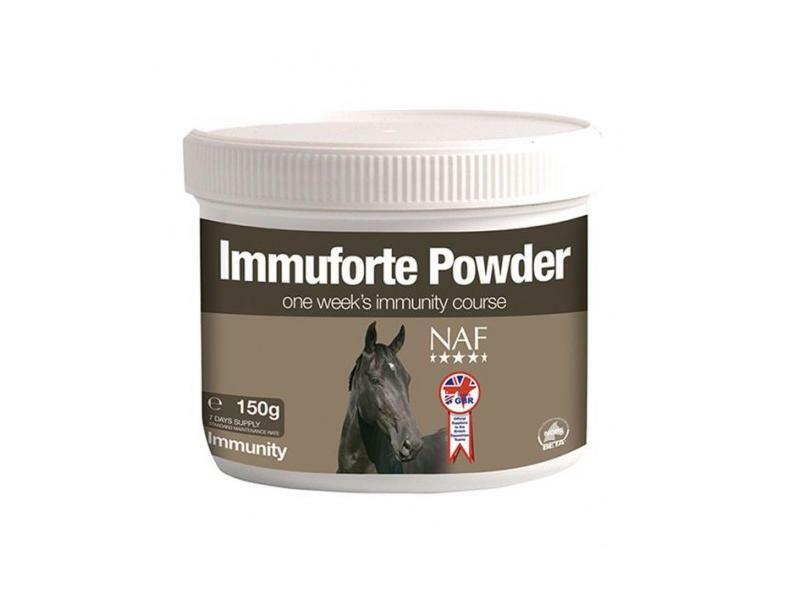 NAF Immuforte Powder is a delicious, easy to administer, highly palatable powder based supplement designed to be fed on a 10 day course. Ingredients include delicious Mint and Echinacea, MSM and Cysteine. Dried whey, dried brewers yeast - saccharomyces spp, mint, MSM, cysteine, echinacea purpurea. Feed as concentrated short course when a compromised immune system most needs support. To be fed as a 10 day course, unless otherwise directed. May be mixed with a little water and given via a syringe. Below are some recent questions we've received regarding NAF Immuforte Powder for Horses, including answers from our team. Hiya my horse suffers from mud fever but ive tried dodson and horrel mud heal and naf mud guard. I was wondering if you could suggest any other supplement to try or if a vitamin supplent would be good to try. You can help to some extent with dietary supplements such as this, but the main thing is to try and keep the skin clean and dry. This can be very difficult, depending on the conditions where the horse is kept, but clipping away long feathers and washing/drying the skin is important. Hibiscrub is a good product to wash the area with. Lather it up with water, leave it to soak for 5-10 minutes, then rinse off well with clean water, then dry gently with a towel. This is usually the most effective treatment I find.